New life in an old "shophouse." 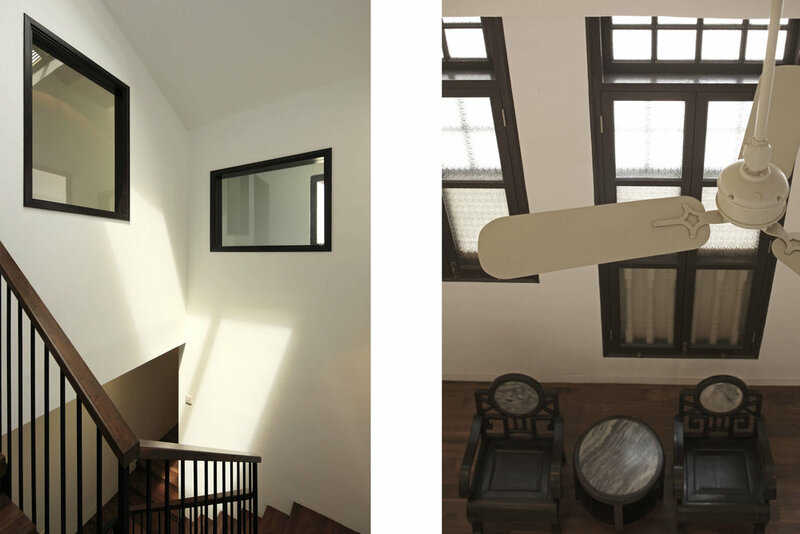 This project is a partial renovation of a classic Emerald Hill shophouse, with the addition of a new extension. The house was designed for a family that holds a sizable collection of Peranakan furniture, containing pieces that are highly ornamental and delicate. It was agreed that the design of the house, by contrast, should be calm and contemporary, with good light and proportions. The role of the house was not to compete with the furniture, but to act as a simple, but elegant setting for them. This house also stands in a quite challenging urban location, as it faces two very different kinds of neighbors. Its frontage is on Emerald Hill, which is quaint, and low-rise. But its rear–where the new extension stands–faces the strong presence of the CTE as it travels north-south. The rear facade addresses this problem with an unusual solution. Windows are rotated to face an existing line of Mahogany trees–that is, their angle relative to the facade changes as they turn toward the densest portions of the canopy. This preserves privacy, without an over-bearing use of shutters or other blocking devices. The result is an interesting innovation, in which windows are installed at various angles, and the facade appears to “twist” as a result.